If you read a beautiful account about the Red Sea’s coral reef, you don’t just have to take the author’s word for it—you can go there yourself! You can dive in, see the fish, and feel the water. But when it comes to the spiritual world, it feels like you have to rely on the testimony of a small number of people to experience it. While the travel path isn’t as clear as booking a flight to Cairo, people do explore the other world more often than you might think. In this episode of Swedenborg and Life, host Curtis Childs and featured guests look to the recorded spiritual explorations of Swedenborg and other modern-day authors to show the timeless commonalities between them. Dr. Erica Goldblatt Hyatt, an assistant professor of psychology and death and grief expert, explains that a spiritually transformative experience (STE) is a powerful moment that can happen to anyone at any time which changes the way the person thinks about the world, themselves, and people around them. The experience usually involves feeling connected with a higher power, angel, departed loved one, or the eternal source. To elaborate on STEs, Cutis introduces author and out-of-body experience expert Graham Nicholls to tell us about his first STE as a young child. You can also read the transcripts from Graham’s full interview here. As Graham explained in his interview, STEs can often work in mysterious ways. 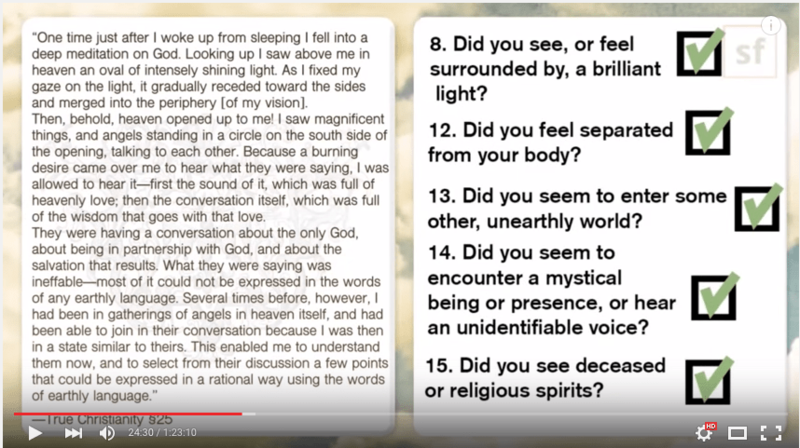 In one of Swedenborg’s recorded STEs, he recounts coming face to face with God and a particularly interesting exchange they had about whether or not he had a “certificate of health.” Curtis jumps in to provide the unbelievable backstory. Guess your past really does catch up with you! Dr. Hyatt kicks off this segment with an overview of what a near-death experience (NDE) is by explaining the origin of the term. The term was actually coined by author and near-death investigator Raymond Moody in his best-selling book Life After Life. Interestingly enough, while conducting research for his book, Dr. Moody was intrigued when he found commonalities between his modern research and Swedenborg’s 18th-century accounts, and he actually references the similarities in his book. Another modern expert who helped to advance near-death research was professor and psychiatrist Bruce Greyson who developed a scale to measure the depth of a person’s NDE based on 16 criteria. In this segment, Curtis takes one of Swedenborg’s STEs and puts it through the Greyson scale to see if it meets the criteria of an NDE. See for yourself, the similarities are shocking! In so many NDEs, there are reports of light. Graham joins the conversation again to explain the significance of light in the spiritual world. Dr. Hyatt describes an out-of-body experience (OBE) as an event where there’s a sense of physical detachment from the body. It often happens during sleep or physical trauma. People report being in multiple places at one time or even visiting higher realms like heaven and hell. Swedenborg’s spiritual explorations include his claim that meditating on a certain topic attracted angels with similar interests to him. Graham elaborates on similar experiences he’s had attracting energies based on what his consciousness was focused on at the time. He shares a personal example of how a person’s emotions or consciousness can influence an OBE. How close is the spiritual world to us? That’s the question Curtis poses at the beginning of this segment. Answer: We’re already there in our thoughts and feelings. According to Swedenborg’s teachings, our minds are affected and influenced by the spiritual world. To help us gain a better understanding of spiritual world awareness, Curtis asks author Richard Smoley to explain how spiritual experiences happen. Are they solicited or unsolicited? His answer is: Both! They can happen out of the clear blue sky or they can happen during intense meditation. According to Swedenborg, spiritual experiences can be induced through breathing exercises and thought-focused activities. It should be mentioned, though, that Swedenborg does not focus on how to access the spiritual world in his writings because his main focus was on showing others how good intentions and actions lead to a spiritually fulfilling life and afterlife. So what does modern research have to say about STEs, NDEs, and OBEs? Not as much as we’d like for several reasons. One reason for this is that there’s a culture of denial in the scientific community when it comes to spiritual phenomena. Since spiritual experiences happen unexpectedly, it’s very hard for science to replicate them in a lab under controlled circumstances. Scientists often categorize these experiences as anecdotal since they don’t have a better way to explain them. Many believe scientists’ unwillingness to even look into spiritual occurrences is actually harming society because it creates stigma around spirituality and prevents us from spiritual evolution. While the research may not be as vast as they’d like, each of our featured guests offer examples of modern studies, peer-reviewed journal articles, and national organizations that attempt to scientifically prove spiritual experiences so that they can be more openly received by the mainstream in the future. Did Swedenborg talk about Enoch, Moses, Isaiah? Swedenborg says thought brings presence and that love brings you near angels, so would it be possible to be close to my girlfriend that is since one month ago in the spiritual world? Meaning, could she feel my love for her? Is the spirit world in the fourth dimension? Swedenborg said some atmospheres are made of playing children. Does Swedenborg ever talk about healing? You opened your show with a statement about people wanting proof of God’s existence. Which book of Swedeborg’s is the best to give a non-believer?